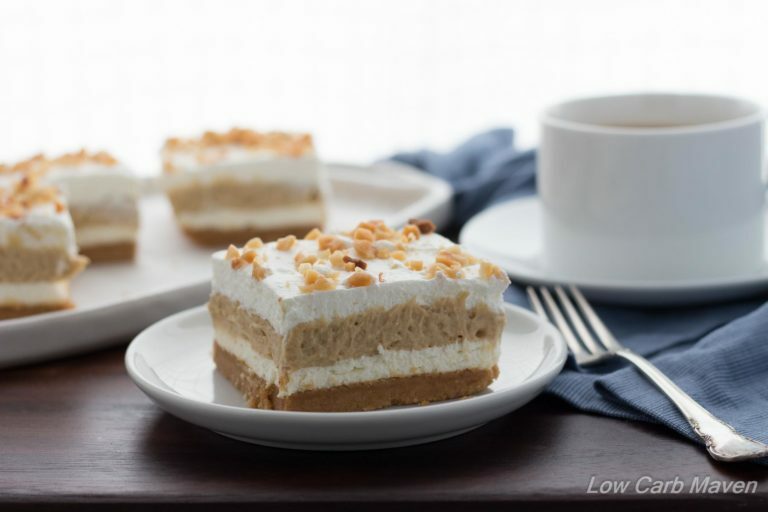 This Low Carb Peanut Butter Dessert is ketogenic culinary heaven! Roasted peanut flour crust, silky sweetened cream cheese, rich peanut butter pudding & whipped cream. Enjoy this popular layered dessert at a fraction of the carbohydrates in the original. I am so excited to share THIS (wildly gesticulating at the picture above) fabulous dessert with you today! I know I teased you with it last week on Facebook and on Instagram and I hope it is worth the wait. I know that some of you are planing to make it for Easter. I’m telling you, you won’t be sorry! Well, the kids and I are leaving for Texas tomorrow. It’s a trip we take every year during Spring Break to visit my parents. We typically spend a week together and try to do something new and fun. This year we’re bringing the kids, to see the stage production of The Little Mermaid!!! Woo-hoo! I’m completely stoked about it. Can you tell? But I am just as excited to help celebrate my niece’s second birthday! “Princess Kristen” is a doll and I can’t wait to see her and her big brother, who is my son’s age. I hope this is the year that kids actually play with and enjoy each other instead of relying on my father or me to entertain them. I can’t wait to see what games they come up with. Okay, back to our regularly scheduled program: It’s low carb peanut butter power hour! 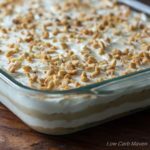 This Low Carb Peanut Butter Dessert is so unbelievably good that I wish I could serve you up a piece right now so you could taste it. It’s a piece of fluffy, creamy, peanut butter heaven! I don’t know who originally came up with these layered desserts, but I could seriously give that person a hug! They are very popular on the blog and I can see why. The first low carb layered dessert I brought you all was the Low Carb Chocolate Lasagna. That’s my favorite. Then, I made a Coconut Cream Layered Dream – utterly delicious if you like coconut. 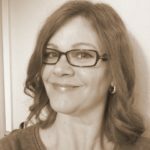 And after making a peanut flour pie crust and a fabulous Low Carb Peanut Butter Pie last month, I knew I had to use them in another delectable layered creation because…. peanut butter! You’re welcome. My husband thinks this version is the best so far but that’s because peanut butter is one of his favorite things in the world. I think he was born with a peanut butter spoon in his mouth! As with the others, this is a very large keto dessert that’s perfect for a crowd. It freezes very well, so if you need a smaller amount, I suggest you make the whole recipe and assemble in two different containers, freezing one for later. I bet your friends and family wont be able to tell that this luscious dessert is low carb and completely sugar-free! The crust is made primarily from almond flour, peanut flour, and protein powder. The three peanut flour options I recommend are Byrd Farms Light Peanut Flour, Sukrin defatted Peanut Flour or PB2 (my last choice because it has added sugar). For the protein powder, I use whey protein isolate. My favorite brand is Nature’s Best Isopure which has zero carbs. I buy the 3 pound jug and it will last me all year. 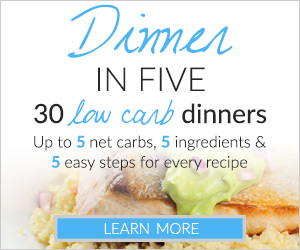 I use it in low carb baking, low carb smoothies and low carb ice cream. Some of you are beginning to hear about and use the Isopure protein powder because of the popular Soul Bread recipe that is making its rounds. I’m commonly asked if the protein powder is necessary in my low carb pie crusts and other low carb recipes. Well, I just want to say that I don’t add ingredients willy-nilly. 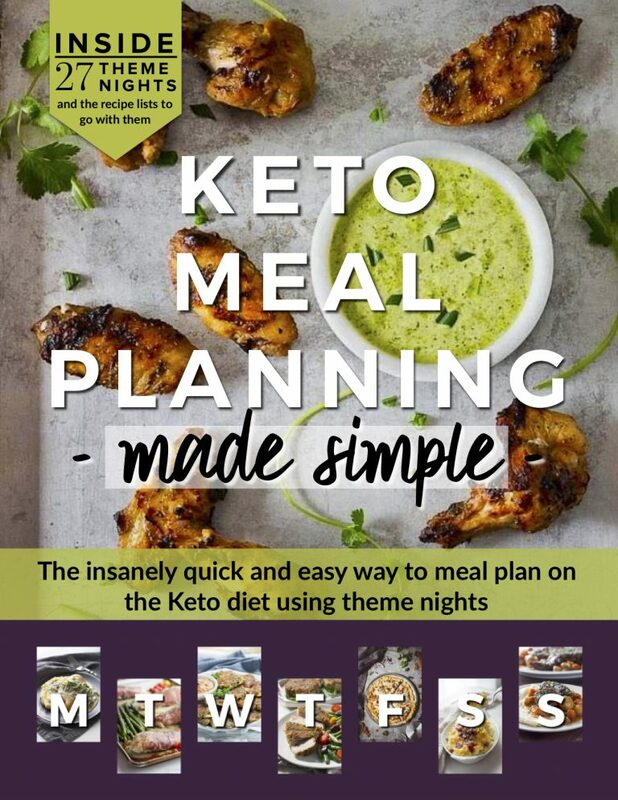 I have a plan when I add low carb ingredients to a recipe. The whey protein isolate contributes to the texture and flavor of the end product. In this case it helps this crust puff up just a little so it’s not tough. Incidentally, protein powder is used in quite a few low carb baking recipes around the internet to help provide structure that low carb baked goods sometimes lack. As I said earlier, this low carb peanut butter layered dream is a large dessert. I will provide a few different nutrition counts in the notes section of the recipe. It can easily be divided into 20 servings and still be more than satisfying. Because of the peanut butter it is a little higher in carbs, a smaller piece is probably best. I think you are going to love it! Low Carb Peanut Butter Dessert is 5 net carbs per serving. 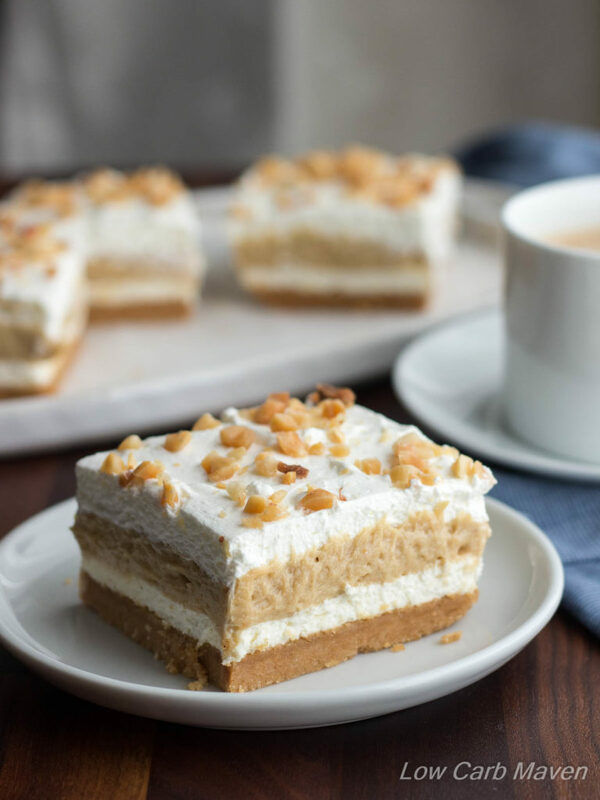 This Low Carb Peanut Butter Layered Dream is ketogenic culinary heaven! Roasted peanut flour crust, silky sweetened cream cheese, rich peanut butter pudding & whipped cream. Enjoy this popular layered dessert at a fraction of the carbohydrates in the original. Preheat the oven to 350 and place the rack into the lower third of the oven. Crust: Place the dry ingredients for the crust in a medium bowl and stir with a whisk. Add the melted butter and mix until combined. I just use a rubber spatula, working the butter into the mixture. Pour the mixture into a 9x13 glass pyrex baking dish and lay a sheet of waxed paper over. With a flat bottomed glass, press the crust firmly into the bottom of the baking dish. Remove the waxed paper and bake in the oven for about 15 minutes or until the crust begins to brown. Cool completely. I make this the day before assembly. Peanut Butter Pudding: Have a sieve, whisk and rubber spatula near the stove. Pour the almond milk and heavy cream into a medium sauce pan/pot over medium heat. Measure the dry ingredients into a medium heat-proof bowl and stir together with a whisk. Add the eggs, mixing well. If the milk hasn't begun simmering around the edge of the pan, turn the heat up to medium-high until it does. Turn off the heat. Slowly pour the hot milk into the egg mixture, whisking the whole while. Put the pot back onto the stove and pour the pudding mixture back into the pot. Scrape out as much of the pudding as you can. PUT THE SIEVE over the empty bowl. Turn the heat to medium and begin whisking the pudding mixture. Nothing will happen for at least 5 minutes. The erythritol has to melt and the mixture will not begin to warm until it does. Continue to whisk. The mixture will get looser and then it will begin to thicken all-at-once and look a grainy. Turn the heat down just a little and continue to whisk for 1 minute. (If you stop whisking for a moment, the mixture should be bubbling lazily). Turn off the heat, move the pot to a cool burner and continue whisking for 1 minute more. Pour/scrape the pudding into the sieve to strain out any cooked egg. Work the pudding gently through the sieve with the rubber spatula and scrape any remaining pudding from the bottom of the sieve. Add the vanilla to the pudding and stir. Add the peanut butter to the pudding and stir. Taste for sweetness. Add powdered sweetener (or stevia glycerite) if you want it sweeter. It should taste a little salty like peanut butter. If not, add more salt. Put a piece of plastic wrap over the pudding and let cool completely in the fridge. I suggesting making the day before assembly. It needs to be cold! Whipped Cream: Put the whipped cream, vanilla, and sweetener into a medium bowl and whip with a hand mixer (or stand mixer) until half peaks form. If you are using xanthan gum to stabilize the whipped cream, then add it now and continue whipping. Whip the cream until is starts to grab the beaters. It will want to stay at the side of the bowl or around the beaters and will be stiff - not butter, but stiff. Cream Cheese Layer: Soften the cream cheese in the microwave and then using a hand mixer, whip it with the sweeteners and almond milk until nice and light. Adding 1/2 cup of whipped cream at a time, fold the 1 1/2 cups of whipped cream into the cream cheese. Spread evenly over the base and refrigerate. 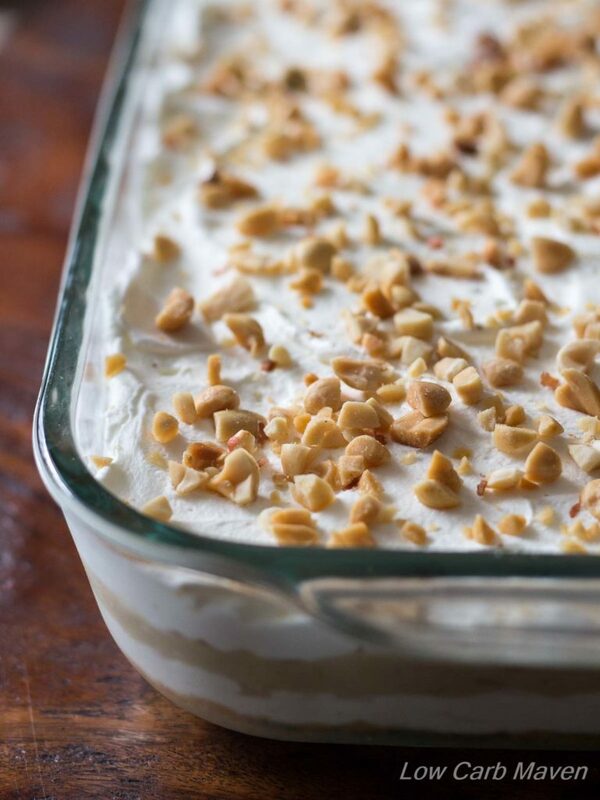 Meanwhile, whip the peanut butter pudding until light and fluffy. Spread evenly over the cream cheese layer. Last, very gently spread the remaining whipped cream over the peanut butter pudding layer. Top with optional nuts if you wish. Chill before serving. I assemble the day before I need it. Previous Post: « Low Carb Sweeteners: Choose What’s Best For You! What flavor of isopure proteins powder do you use? Do you buy the unflavored protein whey or the creamy vanilla? I would like to try to make this! I’m hoping to make this soon, but I don’t have peanut flour. I saw in another comment that I can use the bases of the other layered desserts, so I’ll check those out. Sorry if this has already been answered somewhere on here, but why does the recipe specifically call for low-fat peanut flour? I am a peanut butter fanatic! I am still stuck between this and the chocolate! Help! 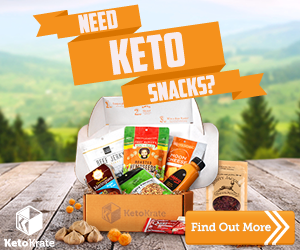 I was wondering if the protein powder and corn starch are approved for Ketogenic dieting? Are you allowed to have these? This looks delicious and I would like to try it. I made this recipe and it tasted great. It’s one of my new favorites. I have one question. My peanut butter pudding became grainy looking and never got smooth like regular pudding. Is this what I should expect or did I do something wrong? As I looked thru other comments I saw my answer ? What can I sub for the corn starch? I see stevia glycerate in a lot of recipes lately (which means I should probably just buy it i suppose!). The cost deters me. I don’t allow myself many deserts. What does it add that something like liquid splenda wouldn’t? Love your recipes! After assembling the layers, does it need to be refrigerated to firm up prior to slicing? My kids would love this! Have a great trip and enjoy your spring break!! !